A reader sent this note: My husband and I are in the process of cleaning out and selling our house for a move to Ecuador. We have been getting information from you for years and are lifetime members of your Ecuador Living Club and are itching to get over there. Do we need to do some type of Visa here before leaving or can we do that when we arrive with the proper documents. Thank you so much for all your information and guidance. 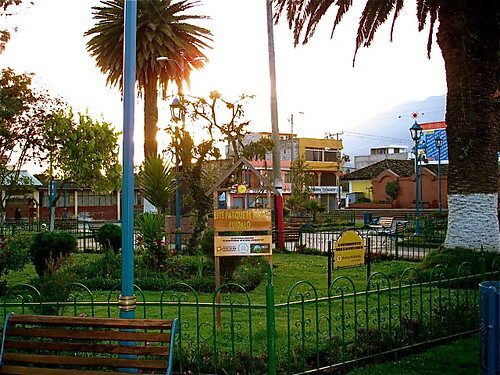 We will be coming to stay at your hotel in Cotacachi as it seems a beautiful place to settle. Looking forward to meeting you and Merri at some future date. It really doesn’t matter where you apply as long as the person applying for residency has the proper advice and all the documents he/she needs depending on the type of visa. In case somebody gets the resident visa abroad, it’s still required to record it here and to get the cedula or Ecuadorian ID here. It’s very important to bring the police background check, marriage license and birth certificates duly apostilled. If they are going to apply for a pensioner visa, they must bring their social security certificate legalized by an Ecuadorian Consulate. Ecuador Living Club members have access to Ecuador attorneys who can assist with visas and real estate in Quito, Cuenca, Cotacachi and on the coast. See how to become a member here. We posted this updated “Ecuador Visa Report” August 12, 2012. When Merri and I first came to Ecuador…. nearly two decades ago…staying on was really easy. As thousands of expats have moved to this Andean nation the government has progressively tightened the rules. This is a natural progression. Other Latin countries have become even more difficult to become resident than Ecuador. One reader for example just wrote: Gary, We have received your letters for a while and find them very interesting. Thank you. You seem to really love what you do and that shows. We may be interested in relocating to Ecuador. We have lived in Panama and currently live in Uruguay, which is very lovely, yet the bureaucracy involving residency/passport is hard to take- 2 years and we are still “temporary residents” despite using the “best” law firm in the country for this! This is why it is important to stay updated on Ecuador visa regulations. Dr. Andres Cordova speaking to Ecuador Living subscribers. Ecuador attorney just wrote: Dear Gary: I got several emails from the original Ecuador Visa Report made available to your Ecuador Living Club subscribers. I have freshened the original with some Ecuador pictures and a couple of corrections and have made a new report with FAQs. We get lots of repeat questions. I will issue a second VISA FAQs and update report sometime down the line. Ecuador migration offices have been flooded with visa requests since some time ago and have also undergone some audits. Changes in procedures have taken place and things are much stricter now so strict compliance and overview of each case is important (it’s always been to us). Processing times have expanded too. 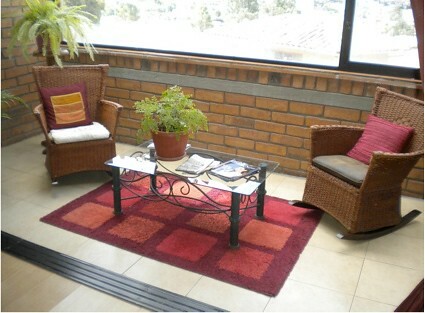 Let us help you in Ecuador with our Ecuador Living Club. Dr. Cordova reduces visa fees by $150 for Ecuador Living Club members. Learn more about Ecuador Living Club services here. 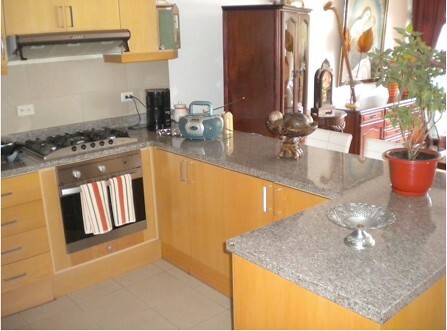 Here is a Cuenca Luxury Home for sale. The location of this unit is just perfect. It is only a half-mile from downtown on the south side overlooking Cuenca. There are two rivers than come together right in front of the building. It has great views from the outside terrace. Modern kitchen with granite counter tops. 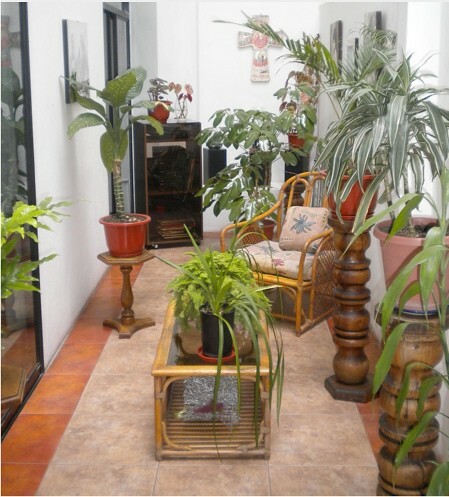 There is an internal patio with lots of light. Each of the bedrooms has direct access to the internal patio. There are 3 bedrooms and 2.5 bathrooms in 1721 Sq Ft. There is also a 2 car garage and a storage room. 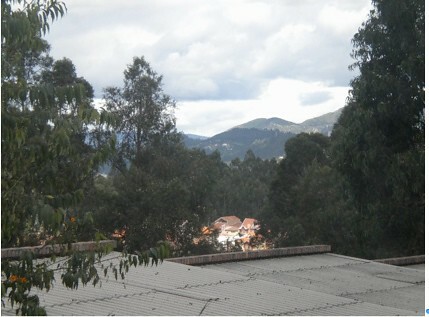 Here is what an Ecuador Living Club member just wrote upon arriving at the Inn Land of the Sun: Just Beautiful, Merri. We safely made it to this gorgeous place and arrived around 22:00 local time last night. Consuelo is amazing and the roses in our room are stunning! 23 hours door to door with a 2-hour delay between Madrid and Quito. Quite a trip! Now we’ll do our best to adjust to the timezone and elevation and regain our breath. Exciting. Thank you for your assistance in all this. Surely you made things a lot easier for us than they might have been otherwise. We have just posted an updated “Ecuador Visa Report” and a list of “Frequently Asked Ecuador Visa Questions” updated to February 16, 2012. Ecuador Living Club subscribers can get this report FREE at their password protected site. Click here. 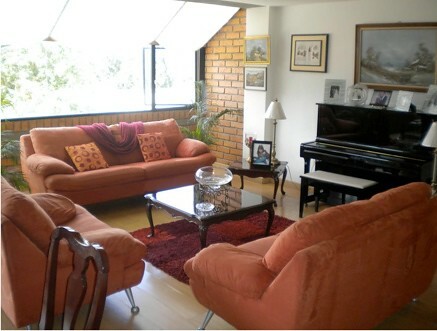 Join a Cuenca Real Estate Tour. Big changes may be coming to Ecuador visa processing so we have just posted an updated “Ecuador Visa Report” and a list of “Frequently Asked Ecuador Visa Questions” updated to February 16, 2012. This is why it is important to stay updated on Ecuador visa regulations and our attorney just sent this note. Dear Gary: I have received multiple emails from aspiring expats who have questions about visas and may require our services in the near future. Thank you so much. I have replied to all emails in a timely and thorough manner. We are preparing thorough information sheets for each type of visa. I am also preparing a report on the real estate purchase (deeding, registration) process. Sebastian and I are closely following what will be important changes our migration authority structures. It appears that in the next several weeks migration affairs will be handled entirely by our Foreign Affairs Ministry. At the time resident visas are handled by the Interior Ministry. There is also some information that some municipalities may get some jurisdiction on this. As soon as I can confirm news on any changes I will prepare a report. Andres wrote a week earlier: Dear Gary: I got several emails from the original Ecuador Visa Report made available to your Ecuador Living Club subscribers. I have freshened the original with some Ecuador pictures and a couple of corrections and have made a new report with FAQs. We get lots of repeat questions. I will issue a second VISA FAQs and update report sometime down the line. Join the Ecuador Living Club and remain updated on visa application procedures. Safety from radiation… safety in Ecuador and safety anywhere is the focus in this Saturday Q & A. #2: Protect against radiation and travel in Ecuador… or anywhere. 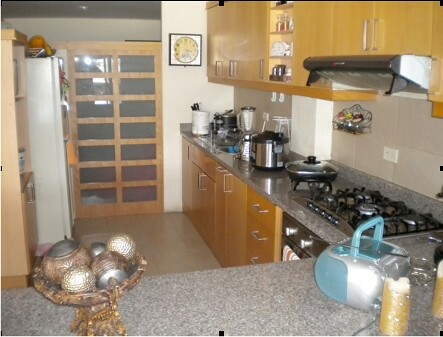 #3: Safe places far from the crowd like Vilcabamba real estate. #1: Safety from Radiation. Two days ago I introduced a Protect Against Radiation report. Merri and I immediately prepared this, outlining seven steps we took after being exposed to high levels of radiation from Chernobyl. The fact that we have faced radiation exposure problems and overcome them put us in a unique position to help our readers… and more. I thought long and hard about how to share this. We are in a unique position to help and want to make this information available to as many readers as we can. So we sent the report to all our paid subscribers free. Because this data reaches beyond our readership we published the report with Amazon.com’s self publishing associates so anyone can get the report on their Kindle. Amazon obviously won’t let us offer a free of report so we have offered the Protect Against Radiation Report for $4.99 rather than our normal $29 rate for a report of this size. I believe the knowledge Merri and I gained from being radiated during Chernobyl saved our lives. I know that many of our readers have a lot of fear right now so we decided to share this quickly because the problem appears to have grown even more serious. by David E. Sanger, Matther L. Wald and Hiroko Tabuchi says: WASHINGTON — The chairman of the United States Nuclear Regulatory Commission gave a far bleaker appraisal on Wednesday of the threat posed by Japan’s nuclear crisis than the Japanese government had offered. He said American officials believed that the damage to at least one crippled reactor was much more serious than Tokyo had acknowledged, and he advised Americans to stay much farther away from the plant than the perimeter established by Japanese authorities. The announcement opened a new and ominous chapter in the five-day-long effort by Japanese engineers to bring the six side-by-side reactors under control after their cooling systems were knocked out by an earthquake and a tsunami last Friday. It also suggested a serious split between Washington and its closest Asian ally at an especially delicate moment. 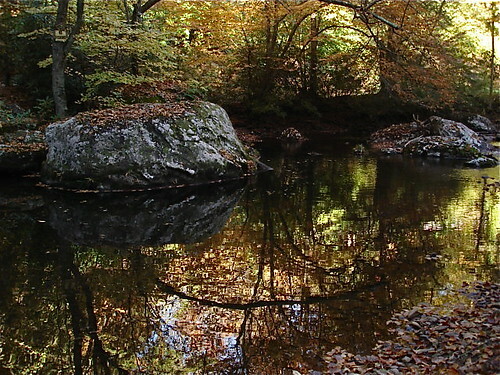 Mr. Jaczko’s most startling assertion was that there was now little or no water in the pool storing spent nuclear fuel at the No. 4 reactor of the Fukushima Daiichi Nuclear Power Station, leaving fuel rods stored there exposed and bleeding radiation into the atmosphere. A forecast by the Comprehensive Nuclear Test Ban Treaty Organization suggests that the radiation could reach North America soon. 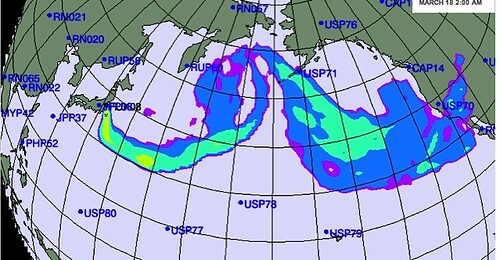 Here it shows how weather patterns this week might disperse radiation from a continuous source in Fukushima, Japan. Plus a number of articles show that one solution is potassium iodide, but some are having problems getting it. A BBC article two days ago said: Radiation Pill sales surge in US. Several potassium iodide manufacturers are reportedly out of stock. Fears of radiation sickness stemming from the unfolding nuclear crisis in Japan have prompted a surge in US sales of potassium iodide. Potassium iodide (KI), a salt, floods the thyroid gland with non-radioactive iodine which lessens the amount of radiation the gland can absorb. Pharmacies do not generally carry KI, but several manufacturers have reported being out of stock. The US government has a stockpile on hand in case of emergencies. Online retailer nukepills.com said via its Twitter feed that it had sold out of KI pills on Tuesday. It received 3,800 orders in 18 hours on Sunday and has shipped 50,000 pills to Tokyo, with the help of Harvard Medical School. Debby Fleming Wurdack, co-owner of Fleming Pharmaceuticals, which produces a KI solution on demand, told the BBC the firm would be out of stock by the end of the day. The problem of getting radiation protection was not limited to the USA! A Canadian TV website says: Radiation fears spark rush for iodine pills. Stores that sell iodine supplements are selling out as people react to the possibility of radiation exposure from leaks at nuclear plants in Japan. Since word emerged that Japan has begun distributing potassium iodide tablets to residents near the Fukushima facility, other global regions have noted a spike in sales of the pills. In Russia’s Far East, not far from Japan, residents are buying up the pills in droves, according to a report in the Wall Street Journal — even as the Russian government insists that radiation levels in Russia remain at normal levels. There are reports that packets of potassium iodide pills are attracting bids of up to US$540 on eBay. And British Columbia’s top medical officer, Dr. Perry Kendall, also noted a run on iodine tablets. The article goes on to say that Dr. Kendall ordered pharmacists not to sell the pills. One reader from British Columbia had something to say about this when he ordered our Protect Again Radiation Report: The medical services of BC have told the pharmacists NOT to sell us the potassium iodine! A New York Times March 14, 2011 article entitled “Radioactive Releases in Japan Could Last Months, Experts Say” says: WASHINGTON — As the scale of Japan’s nuclear crisis begins to come to light, experts in Japan and the United States say the country is now facing a cascade of accumulating problems that suggest that radioactive releases of steam from the crippled plants could go on for weeks or even months. The emergency flooding of stricken reactors with seawater and the resulting steam releases are a desperate step intended to avoid a much bigger problem: a full meltdown of the nuclear cores in reactors at the Fukushima Daiichi Nuclear Power Station. So what can one do? Here is a problem that could be serious. Many (including me) doubt that the Japanese, US or Canada government will give us the total story. Instead our fear is that politicians will downplay any negative potential for political and panic reasons. How can we adjust our lives to cope with what may become a long term reality. There appears to be many things we can do. A 2008 report that was in Reuters, The Telegraph and I suspect many other papers says Red wine ‘can protect against radiation’ suggests that wine can help and says: Scientists may soon recommend that it is best you start drinking heavily and not just because you may be facing oblivion. According to the latest research, red wine – along with its many other claimed benefits – may also protect you from radiation exposure. A team at the University of Pittsburgh School of Medicine have discovered that resveratrol, the natural anti-oxidant found in red wine, can protect cells from the damage caused by radiation. In experiments on mice the scientists found that when combined with the chemical acetyl and administered before radiation exposure it protected the cells and helped prevent death. The results, to be presented to the American Society for Therapeutic Radiology and Oncology, could lead to drugs to counteract poisoning in the wake of a nuclear emergency or attack. “New, small molecules with radioprotective capacity will be required for treatment in case of radiation spills or even as countermeasures against radiological terrorism,” said Dr Joel Greenberger of the Department of Radiation Oncology at the university. “Small molecules which can be easily stored, transported and administered are optimal for this, and so far acetylated resveratrol fits these requirements well. The study was overseen by Pitt’s Center for Medical Countermeasures Against Radiation, which is dedicated to finding radiation protecters that can be administered in the event of a large-scale radiological or nuclear emergency. Don’t go out and load up on red wine! The article suggest that more is involved and I suspect that the downside of the alcohol would be worse than the upside of the protection. Non fermented fruit would be better. Blaine Watson, our friend and Vedic astrologer, sent some ideas along in his daily emailing. Blaine has worked with some of India’s top healers and these ideas come from a raw food advocate David Wolfe so the ideas below are worthy of research. Note below that Blaine will conduct the Investing and Business Beyond Logic seminar in Mt. Dora, April 9 and 10, 2011. #11: Wolfe also recommends high-dose vitamin C, as much magnesium as you can get down (raw cacao is an excellent source), selenium (Brazil nuts are loaded), and coconut products (natural organic coconut cream and coconut oil), which are very supportive to your thyroid. #12: I would add astaxanthin to the list, which is the most powerful antioxidant found in nature. It has such potent anti-radiation properties that it’s been shown in scientific studies to protect people from sunburn! Dr. Mercola has excellent Himalayan sea salt, coconut oil and chlorella. So there may be some steps we can take to improve our lives despite any increases in radiation. Merri and I know that we are healthier today then we were before we were exposed to high levels of radiation. The exposure set us on a path to improve our health and the benefits we gained have surpassed the damage done by the radiation. We do eat a lot of seaweed and take sun chlorella everyday just to combat the ravages of modern life. We explain why in our Protect Against Radiation report. #2: Protect Against Radiation and Travel in Ecuador… or anywhere (click here). See More information on radiation problems in the links below. Posted on 21 September 2009. Tags: Adilet, ATM, Automated teller machine, bank, bank account, bank director, bank guard, banking, Business_Finance, cashier, Cheque, Colorado, Cotacachi, Cotacachi Museum;, Credit Union, currency traders;, Danish Parliament, David Cross, Debit card, Denmark, Ecuador, Ecuador Coastal Real Estate Tour, Ecuador Import Export Tour, Embedded systems, EUR, Fedex Corporation, FedEx;, fischer@jgam.com, Global Service;, guard, Guayaquil, Guayas Province, Inc, internet, internet business course, investment management bank;, Jyske ATM Banking;, Jyske Bank, Jyske Bank A/S, Jyske Bank Rene;, Jyske Ecuador;, Jyske Global Asset Management, Kansas City, Kingdom of Denmark, Las Viandas Meson, Latin America, managed or advisory only services;, manager, mathys@jbpb.dk, Meson, Moody's Investors Service, North Carolina, open bank, Payment systems, Peter Laub;, profitable internet, Quito, S.L., Standard & Poor, Standard & Poor's Securities Inc, teller, Thomas Fischer, United States, US Federal Reserve, USD, Visa, VISA debit cards, Web Based, webmaster, World Economic Forum, Yahoo Canada, Yahoo! Inc.
Ecuador banking notes from Ecuador subscribers are below. 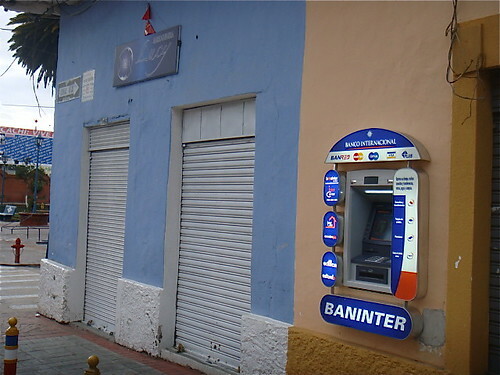 This is the Ecuador bank and ATM we use in Cotacachi. Before we look at these Ecuador banking notes, you should be aware that non residents cannot open checking accounts at an Ecuador bank. They can open a savings account. Visa credit cards work at ATMs operated by Bank of Guayaquil, Pichincha, Produbanco and Banco Pacífico. Each ATM shows the logos of which cards can be used on that machine. 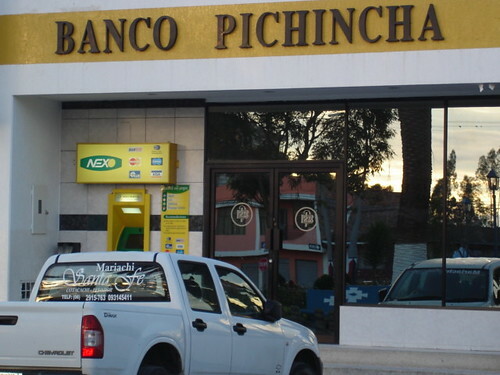 We use our regular ATM cash card issued by our Florida bank at this Bank of Pichincha branch (shown above) on Cotacachi’s second smaller plaza. 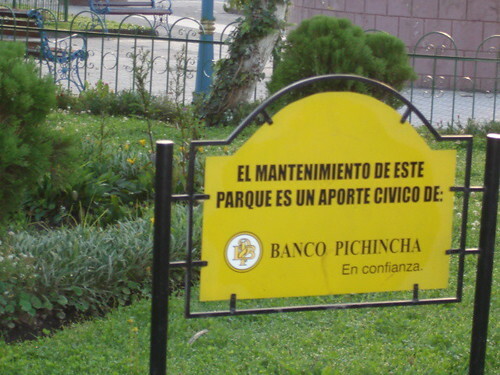 The plaza is pristine because it is maintained by the bank. 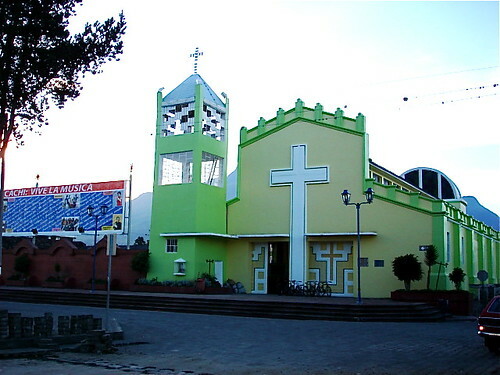 The bank is next to the police station and the second smaller Cathedral. Here are some Ecuador banking notes sent by subscribers. You can add recent experience to your banking info that you can write a check on your US account and send it to an Ecuadorian bank for deposit. Normal mail takes about 5 days to Quito. BUT, you can’t make it payable to the bank with instructions to credit your account. Nope. You have to make it payable to yourself and then, get this, endorse the check. You cannot do, as you would in the US, add “Deposit Only to Acct 12345” — So, you are sending an endorsed check through the mail. This means it is just like cash. This is completely different from anything I have ever seen in the banking world. Then it takes about a month for them to clear the check. Your alternative is to pay about $40 to wire the funds, and the Ecuadorian bank will charge to receive them. Or, you can get a cashier’s check and FedEx. 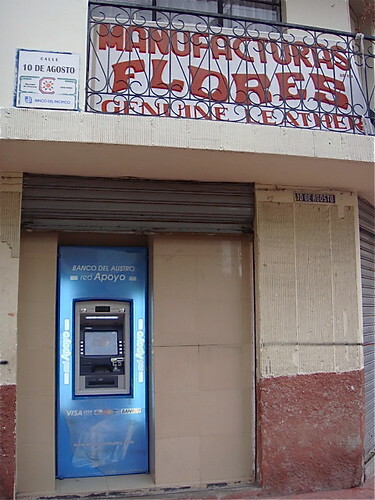 There are three Cotacachi ATMs. Two are on the main street 10th of August. Here is one of them…the newest of the three. We are allowed to take $500 a day from the Pichincha ATM and $300 a day from the others. Ecuador banking like in every country, has its peculiar glitches including with ATMs. Here is another sent by a reader. When using ATM’s and cash cards in Ecuador, make sure you get your cash from a machine that is in, or at the front door of an open bank. As you receive your cash, check it for smooth feeling bills. Last November we had the disappointing experience of getting 5 counterfeit $20 bills in our ATM withdrawal of $200. We were using an ATM at the “Parque Calderon” in the center of Cuenca, one of the most visited ATM by tourists in the city. Not imagining that there was any risk we pulled our $200 cash out and proceeded to Spanish class. It was there we were told five bills were fakes (all Ecuadorians who work with money are extremely aware of counterfeit bills as they have to cover the loses from their own pay) We were flabbergasted, especially when the woman at the school told us this had happened three times in the last month. We called the card provider ( a Credit Union in Colorado) and they told us that as it was not in the US, there nothing they could do. We went to the bank that owned and stocked the machine eight days in a row (each day we were told the person to see would be in the next day) trying to talk to someone who could/would do anything. It was not until we started using the word “Falsos” rather loudly in front of the crowd in the waiting line (usually about 50 people in Ecuador) that we were finally sent to a manager. The manager set us up with another manager who did not show up for our meeting either, and then another who blamed it all on the main office in Guayaquil. Finally we just marched in and went straight to the top, the bank director who kindly spent an hour showing us that the problem could not have ever happened and that the fakes must have been put in when the bills were packaged in Kansas City by the US Federal Reserve. Knowing that a $100 loss would be devastating to a typical Ecuadorian family where teachers and policemen make $150 a month, we decided to bring charges against the bank, if only to catch their attention. Needless to say the case is making its way agonizingly slowly through the Ecuadorian Justice system and we don’t ever expect to see our money back, but we can warn others. -Avoid cash machines not attached to banks. -Pull your cash out in a very visible place, preferably with the bank guard watching. -Rub the bills between your thumb and fingers to feel for a different texture (fake bills are smooth like copy paper). -If you think you feel any difference, immediately take it to the guard or teller and demand new bills. Ecuador is an amazing place but even and especially the locals trust the banks and bankers about as far as they can throw them. As you say once bitten twice shy. Here is Cotacachi’s third ATM. One nifty way to combine global investment management bank and your cash needs in Ecuador is through Copenhagan with Jyske Bank’s VISA debit cards. This card makes it easy to access cash from your Danish bank account. Why a Danish bank? As mentioned earlier I do not trust Ecuador banks. On the other hand Danish banks are among the safest in the world. First let’s examine safety. How safe? In recent years Denmark has been rated by Standard & Poor’s as one of the safest country in the world in which to bank. Jyske Bank is well established with a history of over 100 years. Jyske is Denmark ’s second largest bank, with 450,000 clients in Denmark and over 30,000 abroad. Jyske Bank has over 23 billion euros in assets and also happens to be one of the leading currency traders in the world. Many other large banks use Jyske to handle their off hour currency positions. This means that Jyske is huge when it comes to multi currency activity. In fact their turnover reaches $50 billion dollars a day. Bank Safety Point #1: A recent Yahoo Canada article shows a survey by the World Economic Forum listed five safest countries in which to bank. So Denmark is a safe place to bank. Now let’s look at Jyske Bank’s safety rating. Bank Safety Point #2: On October 10 2008, Moody’s affirmed Jyske Bank’s long-term Aa2 rating. This decision came despite the deteriorated economic prospects in Denmark, particularly in respect of the property market. Bank Safety Point #3: Also on Friday 10 October 2008, the Danish Parliament passed a bill that secured all deposits and unsecured claims against losses in Danish financial institutions. The rating of the Kingdom of Denmark is Aaa/AAA with Moody’s and Standard & Poor’s respectively. The people at Jyske are common sense bankers. They had minimal sub prime exposure when that scandal broke. Jyske had zero Madoff exposure. How about service? First of all, Jyske can manage your wealth. For anyone with $50,000 or more to invest Jyske can buy, sell and hold investments from all over the world, stocks, liquid assets, bonds and commodities. They provide full managed or advisory only services. They even lend in multiple currencies to leverage investments for investors with $100,000 or more. Almost no bank in North or Latin America can do this. Once you have Jyske caring for your wealth, they can then provide a steady stream of cash when you need it…via a global debit card. Jyske Ecuador & Global Service. Even US clients who have managed accounts at Jyske Global Asset Management (JGAM) can have a VISA debit card. JGAM opens a specific on demand account with Jyske Bank so funds can be made available via the card. These cards can provide access to cash anywhere in the world…including Ecuador. Jyske offers three different cards to match different needs. Each type of card provides considerable flexibility. This is good advice for when you are banking in Ecuador that we are happy to share. This is why we are providing a special three for one offer with our course Tangled Web… How to Have an Internet Business. This can help you create your own internet business. 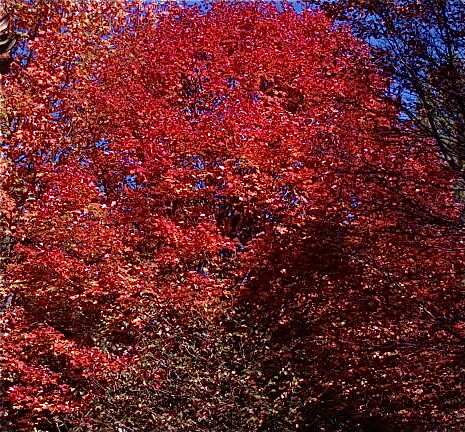 We always conduct our autumn North Carolina course n the first weekend of October… the best time to enjoy the leaf change. Join us with Jyske Bank and my webmaster David Cross in West Jefferson North Carolina. Learn more about global investing, how to have an international business at the seminar. You’ll see views like this on your way to West Jefferson. In Cotacachi the weather is always Spring like. 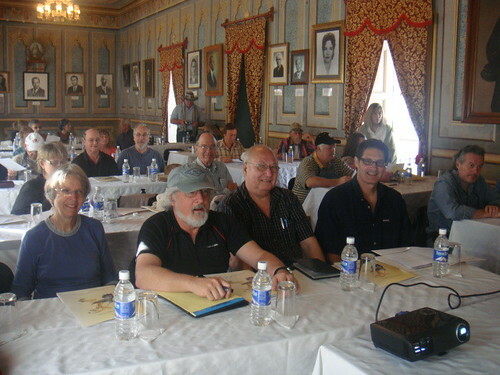 Here is our group meeting at the Cotacachi museum next door to our hotel Meson de las Flores. Let our friendly staff at Meson serve you. 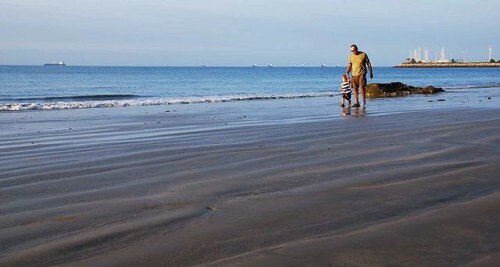 Ecuador winters are shorts weather on the beach as this photo shows. Join us in the mountains and at the sea. Attend more than one seminar and tour and save even more plus get the three emails courses free. Ecuador scams are like scams anywhere in the world… best avoided. There are enough scams in the world that we have no control over like… Madoff… like Federal spending… like Social Security… like underfunded pensions. Yet we can avoid scams that we would otherwise bring on ourselves. Decades ago we learned that there are many scams in investment markets which is why we have always focused on working with large, experienced global firms like Jyske Bank. 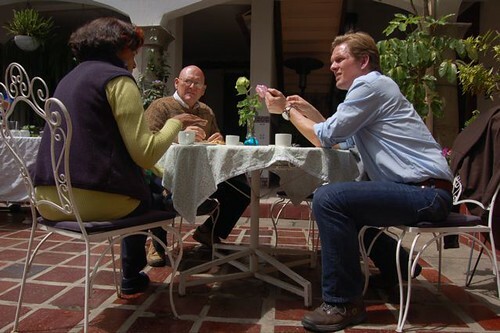 Here are delegates chatting in the courtyard of Meson de las Flores with Peter Laub of Jyske Global Asset Management during an IBEZ Ecuador course. 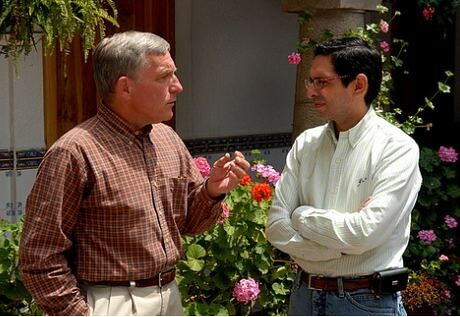 Yet scams go way beyond the investing community and they are everywhere… including Ecuador. When one moves to a new place… it is hard to know all the ropes. This is a bit frightening and often leads new arrivals or investors to depend more on other expats. This can be a huge error… because Ecuador scams… or scams anywhere are promoted as often by other expats as they are by local residents. People are not more honest just because they come from the same country you do. I learned this the hard way when I moved to Hong Kong almost 41 years ago. I had a really wonderful apartment in the mid levels of Hong Kong on Bowen Road. “Bowen Do Ng Ho” (Bowen Road #5 – This is the last of my Cantonese!) 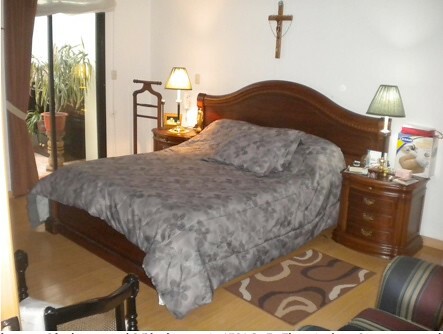 We had an extra bedroom we rented to a very nice American woman. She met a guy who became her boyfriend… a redheaded freckled guy I recall. He was an architect… so he said… with a San Francisco firm arriving in Hong Kong to build a skyscraper. He was a very pleasant fellow… a “jolly chap” my British friends used to say. Somehow, for the financing, the woman, who rented our apartment, became involved. To make a long story short… the guy (and the financing) disappeared. Huge bills owing were strewn around town. The woman, who rented our apartment, was devastated and left on the hook. We had all been fooled until days after this con artist fled. We had all felt more comfortable since we were dealing with what we thought was a “known”…someone from our own culture. So my ears perked up when a reader wrote to me after our latest Ecuador Visa Update. “Gary, When I read your newsletter today, I was hoping you would say something about the cost of a visa. Unfortunately, there are people who are promising newcomers a resident’s visa for $7000. I’ve never heard of anyone paying more than $2000 for a resident’s visa, no matter which lawyer they used. The reader went on to say that one couple discovered this scam and tried to back out of the contract. This elderly couple was threatened by a lawsuit. I do not have all the facts so cannot be sure if this is a pure scam… just really unfair pricing or if more than just a visa was offered, but $7,000 seemed awfully high if all that was provided was just a resident visa. I immediately wrote to the three attorneys who advise us in Ecuador to check on the price. table, cutting corners. This would be bad, but instilling fear on clients is beyond reproachable. Lawyers would normally charge between $800 and $1.000 for a visa, including for a family. In some cases where there is an added complication the cost may be a little bit higher. Some bigger law firms may charge between $2,000 and $4,000 for a visa but normally when obtained of behalf of major investors, corporate CEOs, etc. I believe $800 to $1.500 is reasonable. We charge $800 to $1.000. Regarding expenses, they are of about $350 per visa plus some $100 in general, for the whole family. Best regards, Andres. This is very kind of Andres to offer free legal assistance. He has helped so many of our readers in the past. See ways he has helped readers here. Another excellent and reliable attorney, Roberto Moreno, wrote: Gary, Yes, $7000 is absolutely out of range. Depending on the visa we charge from US$900 to US$1200. Also, it is important to inform the readers that some lawyers will just obtain visas with few requirements, especially in Guayaquil. The risk is that the visa could be removed later on. We prefer now to obtained all the visas for our clients at the immigration office in Quito. Gary Scott and immigration attorney, Roberto Moreno, at Meson. Learn more about Roberto and his firm here. Hi Gary, This is a terrible thing!! Your reader is correct, the cost of obtaining a resident visa, including attorney fees, fluctuates between $1,200 and $2,000, being this last one a very high one. We usually charge about $1,300. Checking with other attorneys from Quito this is the the standard cost. Hope this helps!! 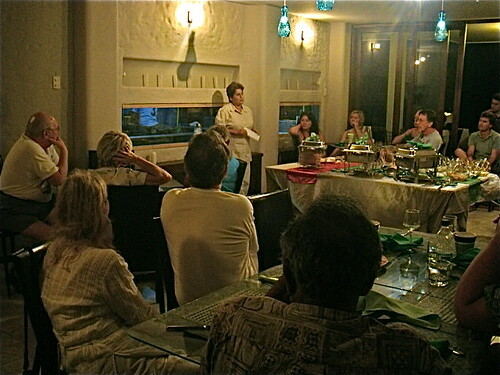 Here is one of our Ecuador real estate tours meeting with our attorney, Floridalva Zambrano. Flori is one of the few attorneys with such experience that when she conveys a property, a US title insurance company will provide US title insurance. Learn about Flori’s law firm here. There you have it… three very reliable Ecuador law firms charge about $1,200 for a resident visa. Whether you feel someone charging much more is a scam or not is up to you… but when you move to Ecuador or anywhere that is new… you are more vulnerable so watch out for price gouging and scams. One benefit of an Ecuador Living subscription is that we do not take commissions or kickbacks on real estate, legal work, hotel or tour reservations… or anything. There are no hidden agendas. 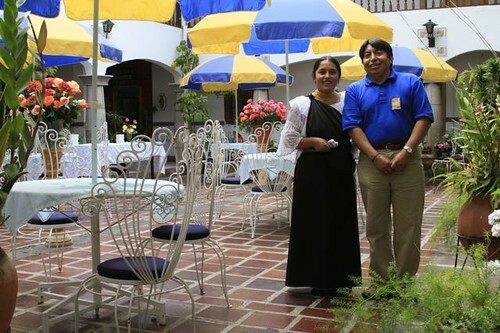 We even donated our hotel to a foundation to help promote employment in Ecuador so we do not even make a penny from the income at Meson de las Flores. Our goal is to help our readers enjoy safe, easy, profitable, low cost journeys to Ecuador. Learn more about our Ecuador Living Service here.